For all the biscotti haters out there… I understand. There are some horrifying biscotti circulating in the universe and it is wrong. There are also lonely biscotti out there… without coffee… without tea… being eaten alone in a sad, dry shameful way. I would not lead you down the wrong biscotti path. Behold: the true biscotti path. Biscotti that is dry, but not sawdust… perfect when dunked into coffee or tea and to be clear you should always dunk biscotti in coffee or tea. 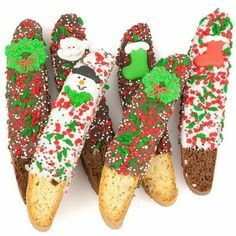 Biscotti that actually has flavor, but isn’t covered in red and green paste and little snowmen and all kinds of overcompensating that you don’t understand how anyone even claims the cookie to be a biscotti when it looks more like Griswald Christmas decor. This biscotti has mini white chocolate chips that melt into the cookie, tart and vibrant dried barberries and a nice amount of sugar coating to sweeten the whole situation up. Be bold and true this holiday season and make these biscotti. Gift them, spread the good news of delicious biscotti. Let’s show the world what this underrated cookie is all about. In a large bowl, beat the butter, sugar, salt, vanilla, almond extract, and baking powder. Beat in eggs one at a time. In a small bowl toss white chocolate chips, barberries and flour together. Slowly add flour mixture to wet mixture until just combined. Divide dough into four pieces and shape in a log on baking sheets. Use wet hands to shape and smooth. Sprinkle with raw sugar. Bake for 25 minutes and remove from oven. Reduce temperature to 325 degrees F. Using a spray bottle filled with water, spray biscotti all over with water. This will make it easier to slice. 5 minutes after you’ve sprayed the biscotti cut them using a serrated knife. Cut them straight down, they are going to stay standing up so you don’t want them to fall. Space them slightly apart. Return the biscotti to the oven, and bake for 25 to 30 minutes, until they are dry and lightly brown. They’ll continue to dry out while cooling. Remove from oven and let cool on wire racks. Once completely cool, move to an air tight container, will keep well for several weeks so they’re perfect for giving around the holidays.